As video calling service has been already available and get popular for some time with the high-speed 3G network, AT&T Inc has recently announced the launch of new video-sharing service that allows consumers to share the live, full-motion video over their mobile phones at the push of a button. However, the video stream only go one-way during live streaming video feeds while callers participating in a two-way voice conversation. With AT&T’s Video Share, either side of users can be the one generating the video stream for the other to see when the Video Share call is activated. 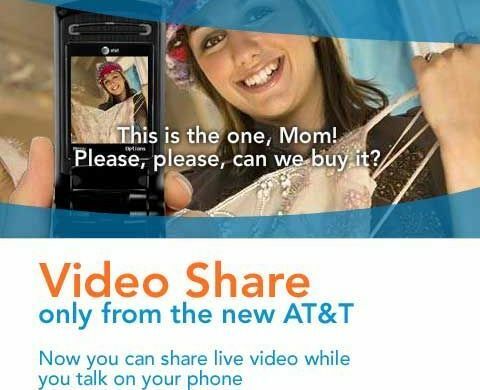 AT&T has offered some service packages for Video Share including $4.99 a month for 25 minutes of usage, $9.99 for 60 minutes, or a pay-as-you-go option which charge 35 cents per minute. In addition, the new service is now only available in three markets: San Antonio, Dallas and Atlanta. AT&T is planning to expand and spread its fantastic Video Share service to most markets that covered by AT&T’s 3G network in coming late July.